Thulasi is a well known herb which is grown in almost all the houses in tamilnadu. Which has many more benefits. This basil is of two types the one with green leaves (Lakshmi thulasi) one with pink leaves ( Krishna thulasi). 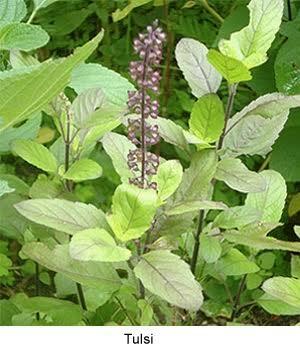 This thulasi plant is well known for its health benefits in clearing cold and cough. These leaves can be consumed directly or dried powder leaves can also be used along with water or milk for clearing throat. In all the temples in South India ” theertham” holy water will be given after the prayer which is mixed with this holy basil to help people to consume it directly, to maintain their immune levels. The unknown hint about this basil plant is it gives oxygen for 20 hours(o2) and ozone (o3) for 4 hours. As a study result published by TOI if the people in India grows 18 basil plants in their home then the ozone layer above India will be strengthen. So this might be a reason behind growing the basil plants in homes from olden days.